AKRON, Ohio — Football is one of the most popular sports in the U.S., but it's the same sport that many parents find themselves pulling their kids off the field saying the sport has become too dangerous over the years. Researchers have proven that multiple hits to the head over a period of years can lead to a degenerative brain disease called Chronic Traumatic Encephalopathy, or CTE. The disease has impacted more than 100 former NFL players, according to the NFL. But doctors at the University of Akron want to change the game plan to make the sport safer. "We hope to protect the athletes and have the game stay alive," Dr. Emily Kennedy said. Dr. Kennedy, plus a team of others, just finished prototyping and testing a new helmet style called the Hedgemon. The Hegdemon, inspired by a hedgehog, is lined with 3-D printed "quills" designed to help reduce concussions during the game of football. "They do bend, but they very rarely break so they kind of act like springs," Dr. Kennedy said. 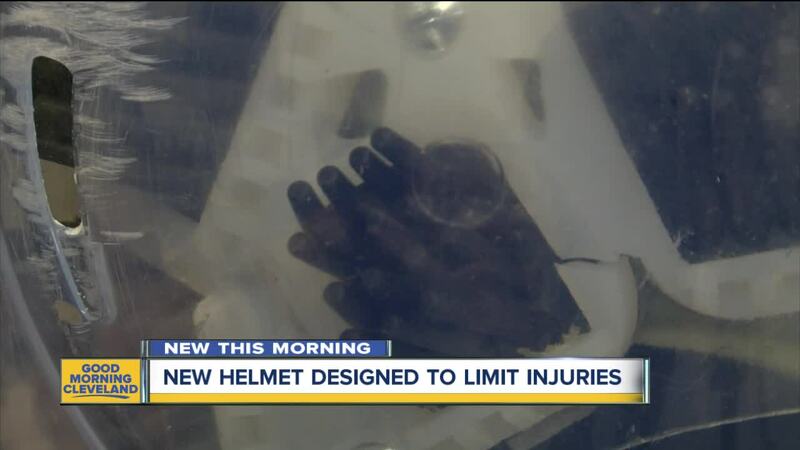 Dr. Kennedy said the helmet they've created dampens both linear and angular acceleration. She described linear acceleration as direct hits to the head and angular acceleration as glancing blows. "Many of the current products on the market lack protection against multi-hit durability and that's what makes our product different," she said. "Researchers agree that angular acceleration is actually more damaging to the brain and our product protects against linear and angular acceleration." The helmet has been in the works at the University of Akron for three years, but now the creators are ready to engage in conversations with football helmet manufacturers to have the Hedgemon licensed. Dr. Kennedy said they hope to have the helmet on the market by 2020.